I confess, I create a LOT of scraps. And I am pretty bad at using them up. 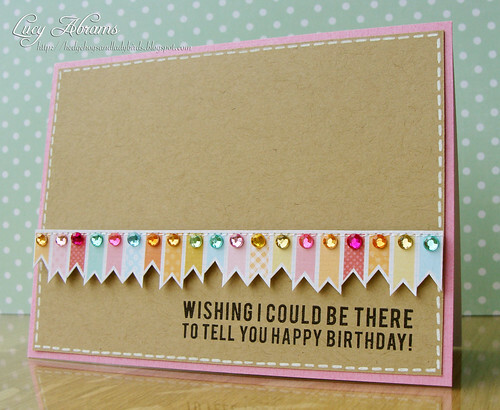 So I am very proud to say that for my card today, I used a leftover scrap of paper from THIS card I made last week. Yay! Just before I go, just letting my UK readers know I have some crafty supplies for sale in my Ebay shop. Click HERE to see what's available. Lucy, this is stunning! I love how you added a bit of bling to each of the flags! The combination of faux and real stitching is beautiful! Lucy - this is just FABULOUS. I adore this! The banner...the jewels...the sentiment...everything!! Bravo for using up scraps in such fabulous style!